This recipe is as easy as it is elegant and it can be assembled the day ahead for even simpler entertaining. Place ham in a single layer in the prepared pan. Place one chicken breast on top of each ham slice. Combine soup, water, and oregano in a small bowl. Spoon over chicken. Top each chicken breast with one cheese slice. Combine bread crumbs and butter in a small bowl. Uncover casserole; sprinkle with bread crumb mixture. Bake for 15 to 20 more minutes or until breadcrumbs are lightly browned and chicken is thoroughly cooked. 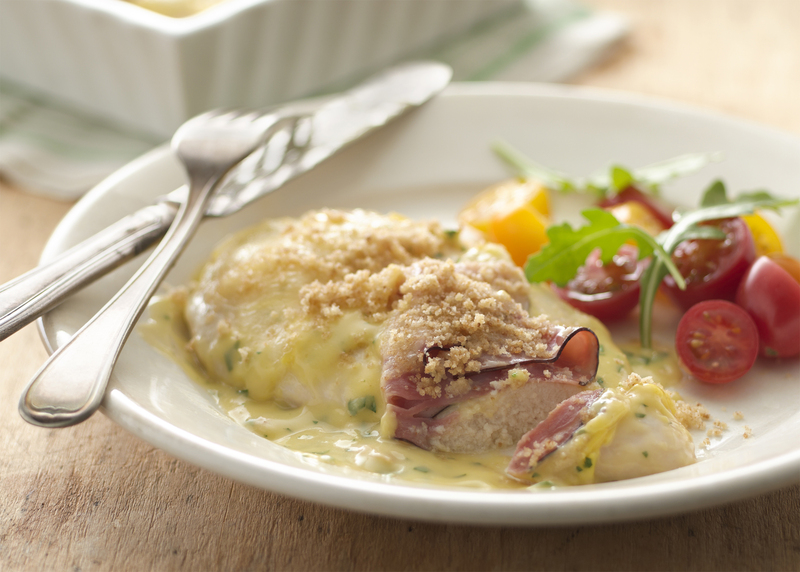 To serve, place one stack of chicken and ham on each plate; surround with spoonfuls of sauce.